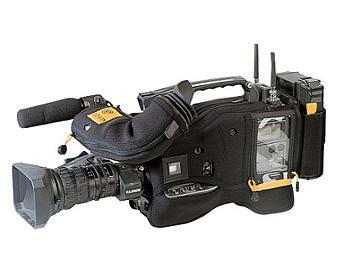 The CG-2 fits Sony SX series camcorders. KATA's Camera Gloves have been custom tailored to fit your camera like a glove, snuggly with no loose ends, offering ultimate protection from dust, extreme elements, dirt, bumps, and scratches. Quick opening to access tape door, control buttons and panels, adjustable battery wrap to accommodate all battery sizes, which allows the use of wireless systems. It also features silent action Auto-Recover zippers. Fashionable design which keeps in line with today's camera image. 1. External layer of nylon elastic knit which enables ventilation and is non-abrasive to your skin. 2. Middle layer of shock resistant advanced closed cell neoprene perforated foam prevents overheating of your camera. 3. Internal knit layer protects the camera body. This non-fray lamination allows you to cut open additional slots to fit your exact working configuration.